This past weekend was so fun! My boyfriend and I had a SuperBowl Party and really just enjoyed ourselves. The weather in Chicago really warmed up so I decided to get out and shoot this trench of mine. I talked about how wearing a trench when petite can be tough. Read all about in this post. I know this one breaks a few of my rules; but I'm wearing all black underneath. So it works because the clean line makes me look taller!! I also lucked out because I can totally wear this trench for valentines day too! I love the moth of February always a great time to but out the PINK! Are you wearing Pink this Valentine's Day? Love how you styled this! You're so lucky taht the weather warmed up! 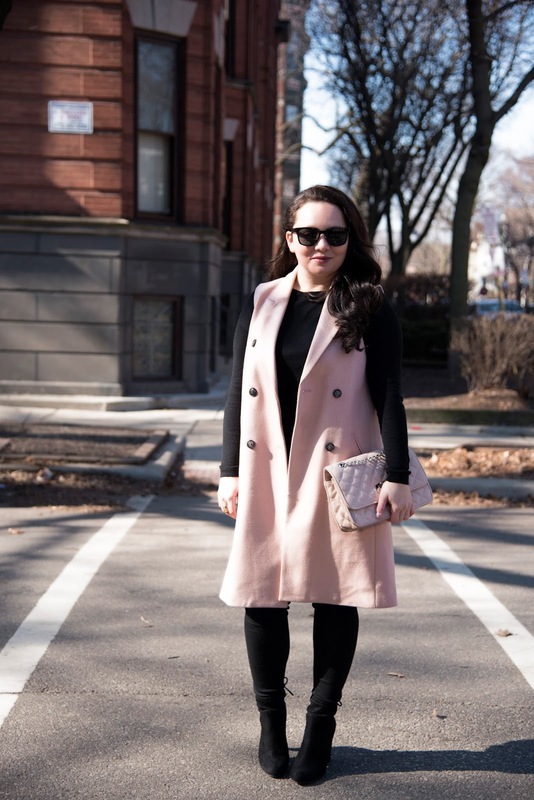 I love this pink trench! I know I really lucked out that the weather shifted for us!! Pink anytime for the month of February is a definite month! I've actually been wearing a lot of blush tones lately, even outside of the month of February. Absolutely in love with that maxi vest and how you styled it! Loving this color on you chica! So cute! I'm such a fan of the color pink and your vest sure is pretty! Thanks lady!! I love this vest!! That pink trench is so dreamy! I'm also petite and struggle with longer pieces, so I'll definitely be taking your tip to wear all black to elongate my body. Helen yes I realized that if the trench hits below the knee that wearing all monochromatic will make you look taller! Ooooh—that blush vest, though! I don't think it makes you look shorter at all! Thanks ladies :) I just had too!! 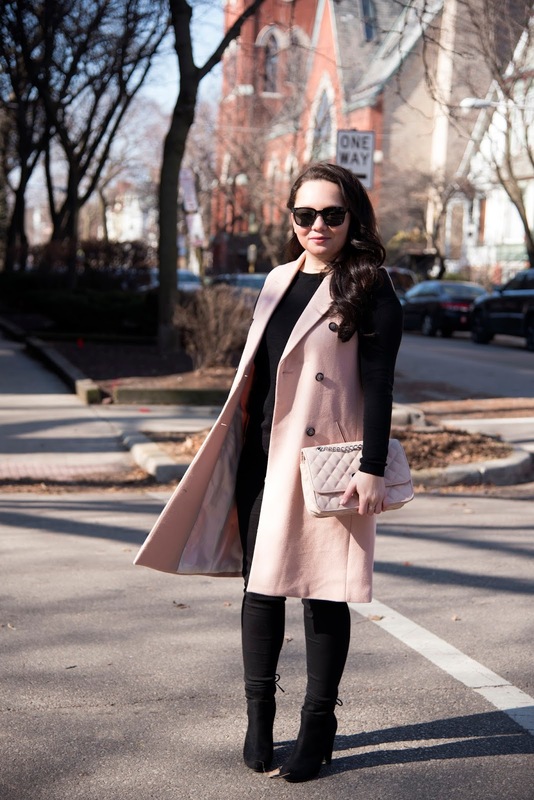 This pink sleeveless trench is GORGEOUS. Loooove! Ashley thanks :) I love this trench!! Thanks lady :) Love them!! The pink trench is stunning. It really makes this outfit pop. I like it lots! I'm petite too! I love this look on you! I am obsessed with blush at the moment. It makes everything look so chic. I have started following you on Bloglovin, I would love if you followed me back! Leah!! Will do :) Now only if I knew how to get on bloglovin' OMG!!! The Style Ride :) Thanks!! Can't go wrong with pink and black! I need this in my life! love the pink trench. adorable and elongating, as you said. Such a fabulous pink trench! It's a classic piece you can wear again and again. The color pink fits you well. I might wear pink this V-Day. Depends. I love the purse as well and background brings out the picture.